Brisbane author and resilience advocate, Karen Tyrrell, launches her latest title for children this week. 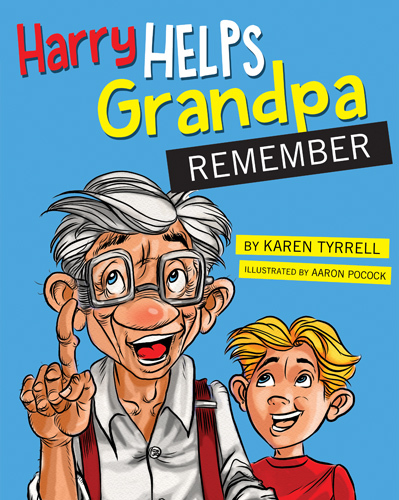 Harry Helps Grandpa Remember is a colourful picture book that addresses the confusing and sad topic of memory loss and Alzheimer’s. Harry and Grandpa love playing hide-and-seek together. Over time Grandpa becomes grumpy and forgetful, refusing to play games with Harry anymore. On Grandparent’s Day at Harry’s school, Grandpa becomes confused and lost. He couldn’t even remember Harry’s name. Then Harry discovers clever ways to boost Grandpa’s memory. How does Harry help Grandpa remember? Endearingly told and full of hope, compassion and humour, ‘Harry’ provides a gentle introduction for children to the realities of Dementia and Alzheimer’s. Read on to learn why I’m so excited to be a part of Harry’s blog tour. Alison: This is your third book about children’s resilience. How did the writing of this one differ from the others? Karen: My first picture book, Bailey Beats the Blah offers coping skills to lift the mood of children who are experiencing sad days and worry thoughts. STOP the Bully (mid-grade) offers positive bully prevention skills in a humorous fast paced adventure. Harry Helps Grandpa Remember reveals the special love between a little boy and his grandpa who has Alzheimer’s. Harry will stop at nothing to help his grandpa remember. Harry offers memory boosting and coping skills in a heart-warming story filled with humour and hope. Alison: Harry is such a cutie. How did you create the character? 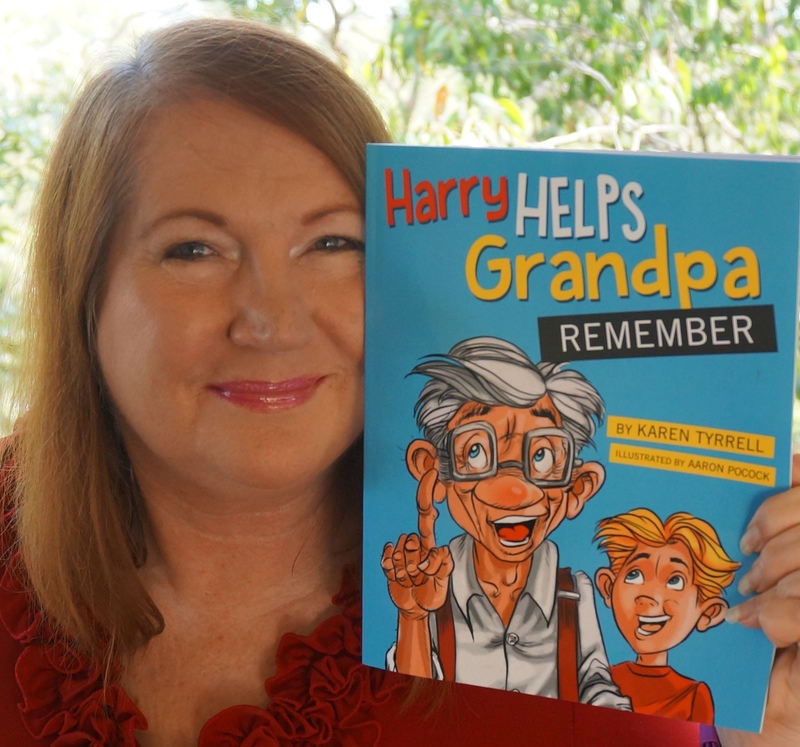 Karen: Harry is a composite character based on my observations on how my nephews and my husband Steve care for their granddad/ father who has Alzheimer’s. Harry’s character was then developed through critique from my writing group, WriteLinks, and from my beta readers. Finally my ex-Penguin editor, Penny Springthorpe suggested further fine tuning in developing a character that would pull your heart-strings. Alison: I have no doubt that Harry is meeting a need in the community. What has the response been from professionals, such as librarians, counsellors, and teachers? Karen: School Librarians and teachers read the story with a tear in their eye, relaying their personal experiences with a loved one with memory loss. They are keen to order multiple copies for the school. They talk about how they will use Harry and the FREE literacy and craft activities to celebrate Grandparents day. Alison: Our school library has your books, and I keep copies in my school counselling office because they are so kid-friendly. How have children responded to Harry? Karen: Children love Harry as a read-aloud book, a story to springboard discussion about someone they know with memory loss. Please leave a comment on any of the sites above for a chance to win a signed print copy OR 5 eCopies of Harry Helps Grandpa Remember. 6 Copies to be won in total. Six Winners announced on 3 July. Good luck! AU RRP: eBook: $3.99 Paperback: $15.95 eBook available on Amazon & online stores. Prev Announcing the Journal Day Winner! This is a great book, and I’m glad to be part of the blog tour. Thanks for stopping by! I agree it’s a great book. See you on the blog tour. A much needed book. I enjoyed reading this interview, Ali is a sensitive interviewer. All the best for the rest of the blog tour. A well-deserved accolade for this important and moving book. Also enjoyed reading the fine interview with Karen Tyrell. Thank you for commenting and visiting. So glad to hear you enjoyed both! Karen has done well to get this book out there and its important message.